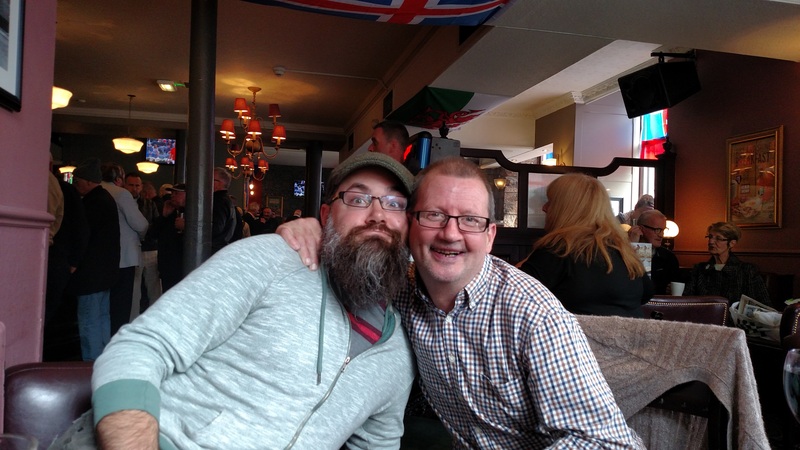 After such fabulous adventures in Edinburgh, we headed the next day to Glasgow. 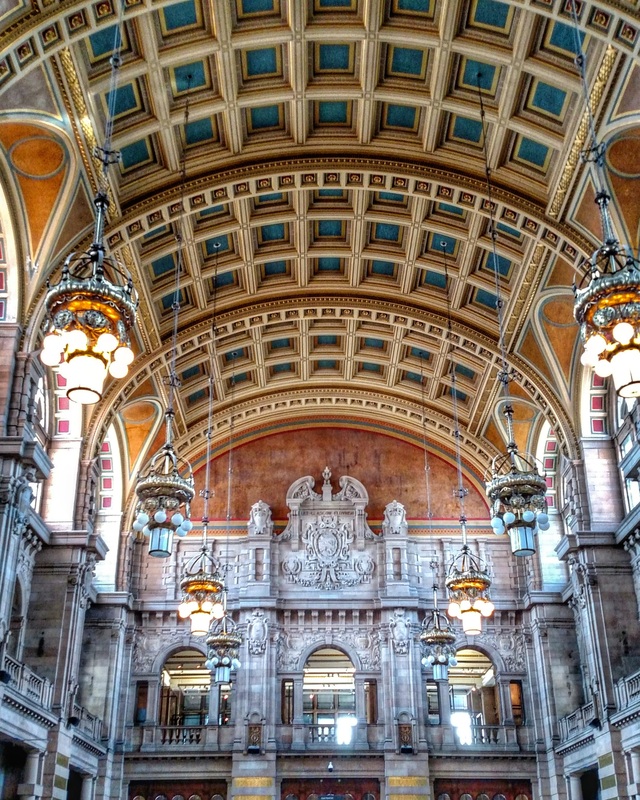 What can I say about Glasgow… not as much as I’d like, for reasons you will soon discover. 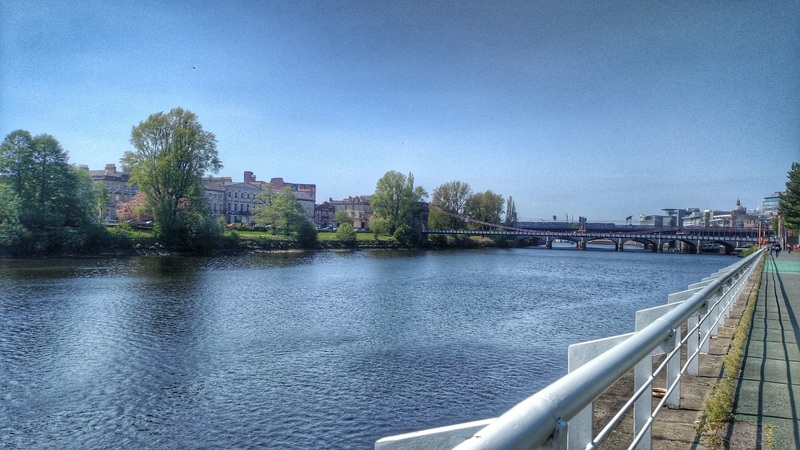 Upon our arrival, we walked to our AirBnB along the River Clyde. Our trip coincided with the best weather Scotland had seen in a while, and the normally genial Glaswegians were in a particularly rare good mood brought on by the sun and warmth after a long, wet, grey winter. Spring had sprung! We explored the city, and ended up walking to the Kelvingrove Museum, which is a delightful mix of natural history and taxidermy (my favorite! ), local history, and world history, with a bit of art thrown in as well. And the building is beautiful!! We saw a haggis in its natural habitat, a mummy, and some nice creepy floaty heads. After exploring to our hearts content, we headed to the cafe and had a perfect afternoon tea. By this time, the museum was closing, so we headed back along the river for pizza and beer by our flat. Next day, we were up and ready to explore. The weather was slightly grayer today, but the people remained the most hospitable I’ve met. Troublingly so. This day was for Charles’ museums, so we spent the morning and early afternoon scouring art galleries, with the afternoon set aside for me to trace some family history, and maybe see the cemetery and cathedral. 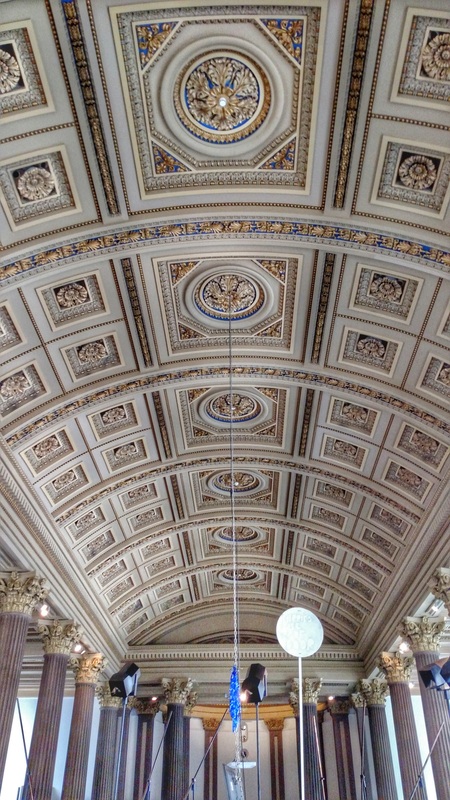 We went to the Glasgow Museum of Contemporary Art, home of a beautiful ceiling, and the CCA as well. The art museums are largely a blur, other than the ceiling pictures I continued to collect, and with the exception of one exhibit at the Glasgow Center for Contemporary Arts that I randomly thought of the other day. Pilvi Takala’s exhibit captivated me for a while, and I could have watched the videos in the exhibit all day. For some reason, this one about a boarding school in particular stuck with me. After exploring, we did a bit of shopping and stopped in a pub for a quick snack (all the chips and vinegar, please!!). In this pub we happened to be seated next to Joe and his girlfriend. Joe really liked Charles’ beard. Joe was a typical friendly and welcoming Glaswegian. Joe and his girlfriend found out we were on our honeymoon. And proceeded to buy us ALL the pints and ALL the whiskeys in honor of our trip. After escaping the hospitable clutches of our new best friend Joe, it was late, we were tired, and we knew we would have sore heads in the morning. As such, we did not make it to see the address where my Great Grandma Greta spent her first five years. It was across the river from where we were staying, but as we had to catch a train into the highlands the next day, we didn’t quite make it there. 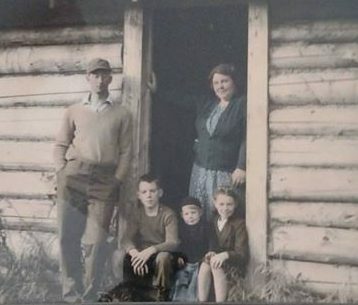 Great Grandma Greta and her family at their cabin in Alaska. Here is a good opportunity to talk about my familial “spirit animal” if you will. I wish I knew more about her, and I really need to talk to family about her before I lose that opportunity. 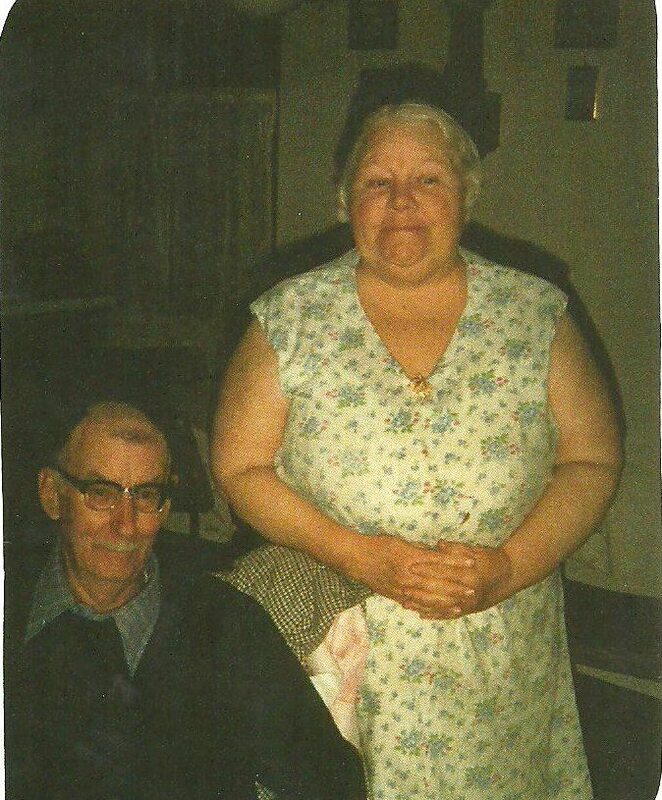 For whatever reason, I feel a special connection to my paternal maternal great grandmother (got that? Dad’s Mom’s Mom). I know she was born in Glasgow, came to America, married my Great Grandfather, and took up residence as a full-time badass. She lived in a lighthouse on Dumplin Rock in MA, moved her family including 3 children to the wilderness of Alaska to live in a log cabin as homesteaders pre-WWII, and in photos she always looked like she was happy, funny, and up to something sneaky. She also sewed my grandmother’s wedding dress, which became my wedding dress. From ancestry.com I learned that she was born in Glasgow around 1910, and at age 5 she immigrated to the US. The records on ancestry even showed me an address for her aunt who lived in Glasgow. As I said, we didn’t make it to her actual address, but it was amazing to be in the city one part of family had connections to. Margret Cross (my great-great grandma), and Margareta Cross age 5, my Great Grandma Greta. Floaty heads at the Kelvingrove!